For employees and shareholders of McClatchy Company (MNI), the owners of 29 daily newspapers including the Sacramento Bee, financial news is not promising. While the problems of many legacy print news organization are well-documented, Sacramento, California-based MNI seems to be particularly troubled. So what are some of these problems? Let start with their 2016 reverse stock split. As reported last year, MNI performed a reverse split. Unlike a conventional split where for example each share becomes two, a reverse split takes 10 shares and consolidates them to become one share. While a regular stock split is a favorable indicator of a stock's performance and prospects, a reverse stock split is just the opposite. Typically a reverse split is done to keep a stock from being de-listed from a stock exchange. That was the primary reason MNI pulled the trigger on their reverse split. Unfortunately, this is not the first time they were required to consolidate shares through a reverse split to keep from being de-listed. It should be noted that in both a regular and reverse split the capitalization does not change. So given this history, how has MNI performed over the last 10 years. In a word, abysmally. First, when the stock was consolidated last year , it went from in early $1.13 to about $11.30. As of yesterday, the stock traded at $7.50, or about a pre-consolidation price of 75¢. 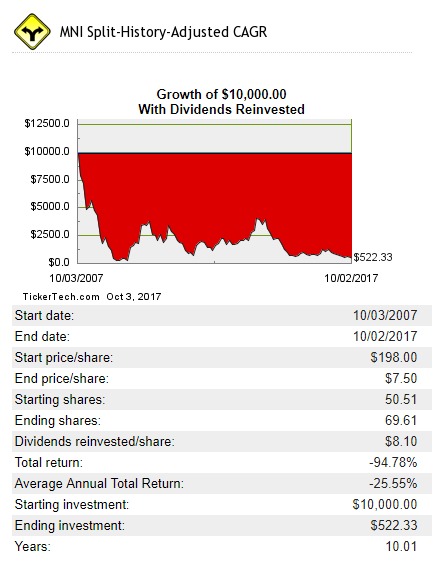 According to SplitHistory.com, $10,000 invested in MNI on October 3, 2007, including dividend reinvestment, would now be worth a disappointing $522.33, or a 94.78-percent loss on the investment. Given declining revenue, a weakening balance sheet, and continued losses, MNI has taken some drastic steps. Asie from the reduction of its staff of reporters, in the latest effort to stabilize finances, MNI sold its Midtown Sacramento corporate headquarters and will be leasing it back from the new owners. What is curious about the MNI, at least as it relates to the Sacramento Bee, is how it is handling access to their content. For a time, the Sacramento Bee had a relatively strict paywall after a certain threshold of page views were reached. Recently though, it seems that the paywall is not active or the access has been expanded to non-subscribers. While readers may welcome the free access, it is evident the Sacramento Bee needs to make up the loss of advertising revenue. A case in point in how a paywall can work is the Washington Post. The Jeff Bezos-owned legacy print media company recently announced that it surpassed the 1 million subscriber mark. As reported by CNN Media, the WaPo, which has a restrictive paywall, is just behind the Wall Street Journal and the New York Times, which has 2.3 million paid subscribers. It is not known how may pay digital subscribers the Sacramento Bee has. More importantly, WaPo Publisher Fred Ryan told employees in an internal memo that they have seen "especially impressive growth in our digital subscription base among millennials as they have grown accustomed to paying for products and services they view as valuable and even essential." While the Sacramento Bee is unlikely to reach the subscriber base the WaPo, Times or Wall Street Journal, it should initiate a stricter paywall policy much like the Sacramento Business Journal has developed to address slumping revenues. The reporters and the entire Sacramento Bee staff provide valuable content, and if they do not generate new streams of revenue to make up for the loss of advertising, that content may soon disappear, and that would be a loss of one of our region's most valued voices. This is getting a little frustrating! First, my son wanted to go to Night School to get his soldering certificate and work for NRC Manufacturing, and then they never came. Then my boy wanted to get a certificate in journalism and work for a newspaper. He's like a chip off the old block, because when I was a kid I was inspired by the Daily Planet and wanted to work for a paper too. Now, EGN paints a pretty gloomy picture about the future of newspapers. What's my boy to do? TV news? Well if the truth be told, he's a little on the homely side like his Dad, so TV would probably wouldn't hire him! And if I may add, his legs are not his best feature, so that leaves Fox News out! Oh well, Trump says the media is fake anyway, so I guess Junior needs to find a new career goal.